If you have sales targets to achieve, sales pipelines to fill, or quarterly sales goals that require excellent prospecting skills, this product is for you! This is also the perfect resource for people just getting into sales or working part-time on growing a book of business. First off, it will teach you that prospecting for new customers does not have to be hard—or wearisome. In fact, many highly successful salespeople enjoy the hunt and have clever strategies for making rejection amusing and quantifiable. However, prospecting is often the “Achilles Heel” of salespeople, and achieving your sales goals requires ongoing skills training. 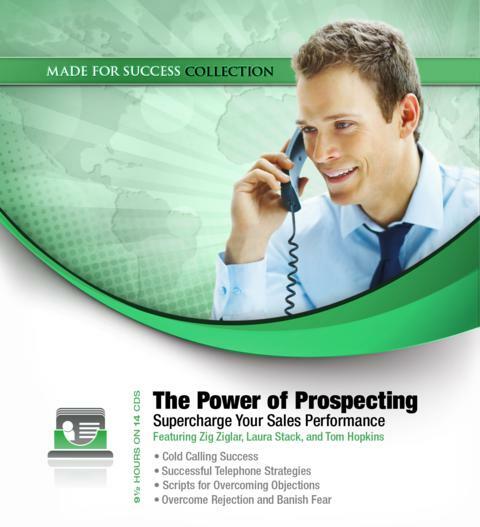 This program will help you shatter your sales targets by becoming a master prospector! Prospecting is one of those rare skills that you need to hear about rather than read about. Listen in as the world’s foremost experts in prospecting share their techniques to propel your sales career ahead of the rest. This collection will help you gain the perspective, techniques, and processes of a variety of professionals so you get the inspiration and education best suited for your industry. Learn from the comfort of your car or on your iPod at the gym.